KANSAS CITY, Mo. 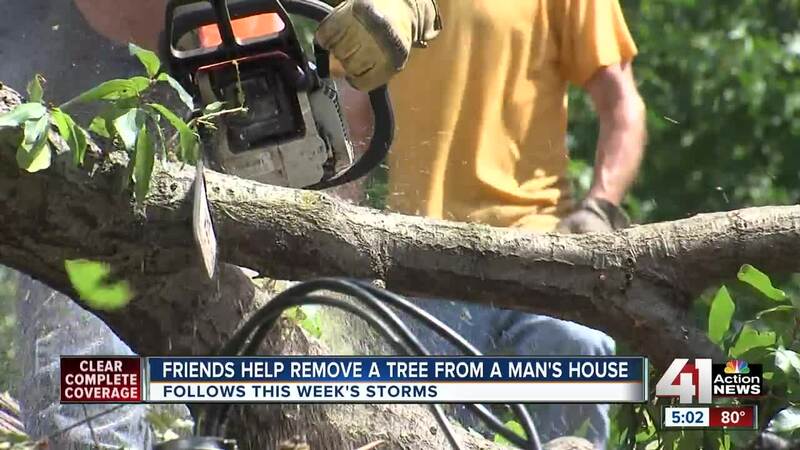 — Many people in the Kansas City area were still cleaning up Sunday after storms rolled through the area earlier in the week. That left those residents spending this Labor Day weekend picking up limbs and repairing their houses from damage. The task was particularly difficult for Mike Thompson who lives at 57th Street and Brooklyn Avenue, where a large tree fell on top of his house and car. "Sixty to 70 mph gusts — I mean, it took it, no problem,” Thompson said. He’s been without power or a vehicle to get to work. "All I can do is just laugh to keep from crying," Thompson said. With the help of his “angels”, Thompson had some help Sunday cleaning up the mess up. “We're no angels," Thompson’s neighbor, Tommy Coey, said. "We're just available." Coey and Laura Moe lended a hand and a chainsaw to help Thompson out. “They've been a big help to me, especially in my time of need,” Thompson said. The neighbors put a call out on Facebook seeking help for Thompson and others joined the effort. "He's a great dude, and he deserves all the help he can get,” Coey said. Coey and Moe piled branches onto a trailer, but finding a place to unload the debris remains and issue and could be expensive at a dump site. "It's going to be a big hit (financially), if we cant really unload this somewhere,” Moe said. Still, help from the community meant Thompson didn't need to spend thousands of dollars to hire a tree cutter — money he doesn't have. He feels blessed to have neighbors willing to lend a hand. “It just goes to show that if you be kind to other people, people be kind to you," Thompson said. "I have no family here, so this is it. I have a lot of friends, but it's nice to know who my true friends are." Thompson hopes power is restored at his house in the next couple of days and will try to figure out something to do with his car, which is not drivable after the tree damaged it.